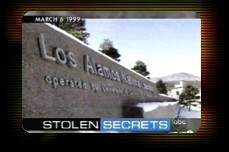 ABC World News Tonight - "Chinese Espionage"
In September of 2000 Los Alamos scientist Wen Ho Lee, who was fired and jailed on charges that he stole nuclear weapons secrets, reached a plea bargain and agreed to cooperate with federal investigators. This was the end of a 9-month long story we covered for ABC's World News Tonight, Good Morning America, and Nightline. At the federal courthouse it was a logistical test - making sure each entrance was covered and getting pictures of the participants arriving and departing. We were always ready for impromptu press conferences, and faced the challenge of making these look and sound good in the midst of dozens of other reporters and crews.